In practice, the easiest way to measure the speed of a reaction is to measure the concentration of either the reactants or the products over time. The concentration of black dots is higher in the beaker on the right than in the beaker on the left. Reactions are often monitored by some form of spectroscopy. In spectroscopy, "light" or some other frequency of electromagnetic radiation passes through a reaction sample. The light interacts with the molecules in the sample, which absorb particular frequencies of light. Less light exits the sample than the amount that entered it; the amount that exits is measured by a detector on the other side. If the concentration of the sample is different, a different amount of light from the spectrometer is absorbed. For instance, suppose the sample is more concentrated. The more molecules there are, the more light is absorbed. Because the beam of light travels through the sample in a straight line, the more concentrated the solution, the more molecules it encounters. It is simple to calibrate the instrument to determine concentration from the amount of light absorbed. In addition, the light may interact with the reactant molecules and product molecules in different ways. 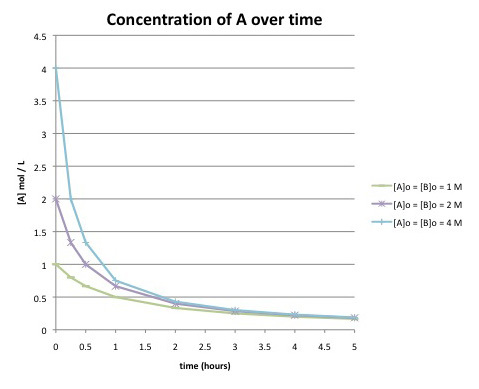 This means that the absorption frequency of the reactants, and not the products, can be monitored, and thus changes in reactant concentration can be measured. This also works for the products.. In other words, the rate is equal to the change in concentration of product with change in time. Concentration can be measured in several units. Frequently, the concentration of a solution is measured, and units such as grams per liter or, much more commonly, moles per liter, are used. The change in time is most often measured in seconds. 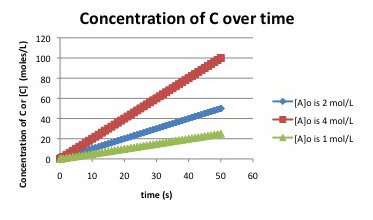 The rate is the change in concentration of reactant with change in time. The negative sign indicates that the reactant is being consumed over time as it turns into product, so its concentration is decreasing. Suppose the rate of the reaction between the black circles and the white circles depends only on the concentration of the black circles; that is, rate = k[black circle]. Compare the rate in each case to the rate in the original beaker. Suppose the rate of the reaction between the black circles and the white circles depends on both the concentrations of the black circles and the white circles; that is, rate = k[black circle][white circle]. 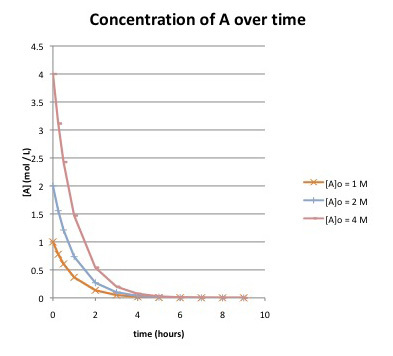 Compare the rate in each case to the rate in the original beaker. Suppose the rate of a reaction in the beaker depends on the surface area of the solid at the bottom of the beaker; that is, rate = k × (surface area of white circles). Compare the rate in each case to the rate in the original beaker. 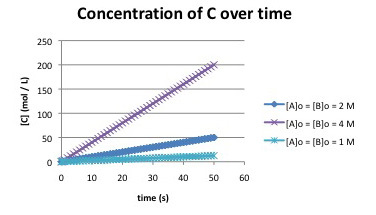 Often in studying reaction kinetics, the changing concentration of a reactant or a product is plotted against time. In one method, many data points are collected very early in a reaction (when fewer than 5% of the material has reacted), and the slope of the resulting line is used to determine the "initial rate." Explain why this method might not work if the data points are plotted all the way until the reaction is finished. What can be determined about the rate law for the reaction? What is a possible rate law for the reaction? Two different rate laws could explain this data. What is the second possible rate law? Propose an experiment to distinguish between these two possible rate laws. b) What can be determined about the rate law for the reaction? Explain. Compare this graph to the one in the previous problem. What are the differences in the curves? Does this reaction has the same rate law as the previous one?